House is next door to Oregon State Park and on a dramatic churn. Grass leads to tide pools and rocks with a short walk on the park road to a large sandy beach. It is a very short walk to the town itself where there are nine restaurants of various types. Yachats is nestled between the mountains and the ocean with beauty in every direction. Storm watchers are invited! In the evenings, a 55' HD TV is available. The state park road is a favorite spot for walking, biking or sitting on the many benches and enjoying the view. This place is just great! Right on the churn with gorgeous sunsets. The house is comfortable without being hotel like. Plenty of space to spread out. The owner was gracious when the oven wouldn’t work. Great fenced in yard for the dogs. My only complaint is that it seems like people do think they need to leash their dogs and it is ok for them to poop in rental yard and not clean up. I swear I picked up more poop from other dogs than my own. I like the property. The covered carport is great for loading and unloading. Fabulous location!!! Our family enjoyed our stay "On the Churn". Kitchen was fully stocked. Fireplace was ready to go. Beds were comfortable. What more can we say about the view - wow! Plenty of room and as my teenager would say, "its like going to grandma's house". Nothing fancy but so comfortable. We walked to town everyday. My teenager liked the small skatepark. Hope to rent again and bring the grandparents. Amazing views and very accommodating for all of our family and pets! The ocean is my happy place. 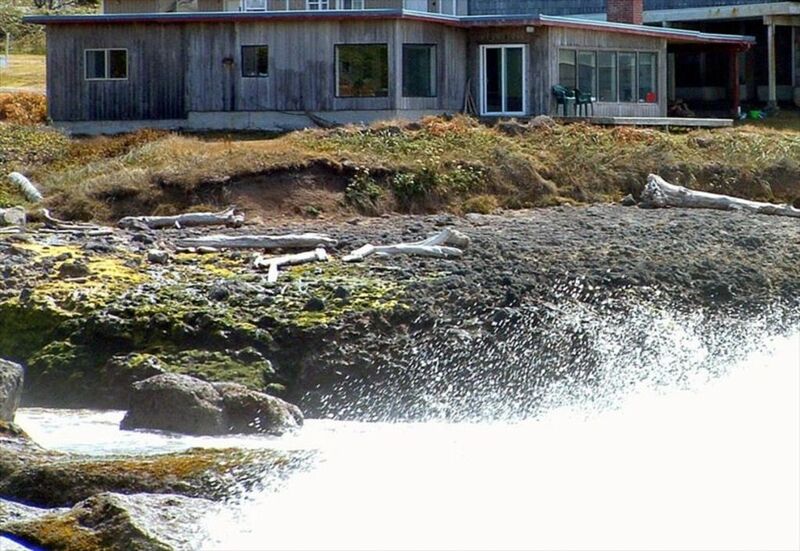 Yachats has a very special place in my heart and this property gave us everything we needed to feel at home. We found ourselves just sitting looking out the windows for hours, cooking (early thanksgiving), laughing, putting puzzles together, playing cards and just enjoying family. Everything is on one level so it was very easy for our elderly parents to maneuver. Thank you for sharing your property with us because you just never know if this our last trip with them and we made so many amazing memories. We will be staying there in the future! We are so glad you enjoyed your time and were comfortable in our house. On the Churn has a long and rich history as a rental, judging by the numerous positive entries both online and in the guest book at the house. And for good reason! This warm, inviting, spacious and comfortable home just plain feels good. No stairs to climb, a fenced yard for your pooch, a large functional kitchen, great water pressure, and miles and miles of ocean to stare at. One bedroom with bath split from other bath and two bedrooms, giving privacy yet with wonderful gathering space for the whole crew. Two Awesome Weeks On The Churn...A Lifetime of Memories! We planned our vacation on the Oregon Coast for more than a year, and one always has to wonder if the trip will live up to one’s anticipation. Well, in this case we needn’t have worried. It exceeded all expectations! We loved our stay On The Churn in Yachats. Sightings from the home’s deck included whales, orcas, seals, pelicans and, most thrilling of all, a bald eagle that flew in and landed on the rocks right in front of us!! On another day we saw a small flock of seagulls seemingly ‘escorting’ a bald eagle out of their territory. Quite a sight! We’re back in the desert southwest now and missing the mesmerizing surf and the sounds of waves lulling us to sleep at night. We enjoyed every moment of our stay and recommend this coastal retreat to everyone. Special shoutouts to Luna Sea Fish House and Ona Restaurant and Lounge! So happy for you. Some special sightings, for sure3. This is a comfortable home with non stop stunning views. Sleeping to the sound of waves crashing was awesome and our family will come again. Parking only on paved driveway. No more than three cars, one per bedroom.